Still intact after over 600 years and a journey that took it from the Middle East to the north of England, the Luck of Edenhall is far more than just a compellingly old, and incredibly pristine, drinking glass. It carries with it a centuries-old legend recounting the power of the glass to protect the good fortune of its owner's household. Known as the 'Luck of Edenhall', this large beaker (drinking glass) of translucent, orange-tinged glass is one of the most exceptional objects in the Museum's glass collection. Its recorded history starts in Cumberland, now part of Cumbria, in the late 17th century, but it was actually made in the Middle East, in Egypt or Syria, around 1350. 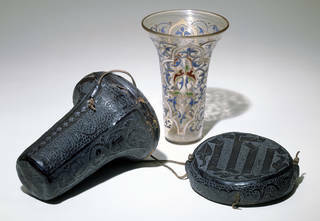 The shape is known from many other beakers of this period, which were sometimes made in sets that fit one inside the other. This example is elegantly decorated with a pattern of intersecting arches and scrolling vines set with leaves of a distinctive shape, known as 'split palmettes'. The decoration was worked in red, blue, green and white enamel, with outlines in gold applied after the enamelling – a wonderful demonstration of the refined skills of Middle Eastern glassmakers of this period. From the Middle East, where it was made, the Luck of Edenhall made a 3,000-mile journey to the north of England. It was long thought that the beaker was brought back by a knight returning from the Crusades – religious wars fought in the Eastern Mediterranean in the medieval period. But the Crusades were long over when it was made. 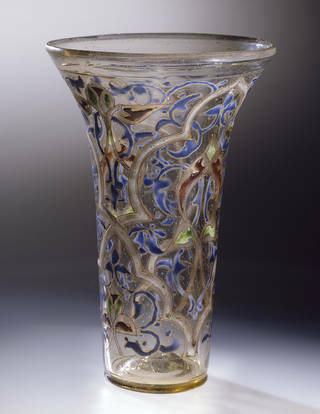 In fact, fine, enamelled glass from the Middle East was a sought-after luxury commodity, traded into Europe by Venetian merchants. What is certain is that the beaker must have been considered an item of great value. We know this because it has its own finely decorated leather case, probably made less than a century after the glass, in France or England. Having this snugly fitting protective layer is undoubtedly why the glass has survived in such pristine condition. The case features the monogram IHS, an abbreviation of the Latin phrase 'Iesus Hominum Salvator' (Jesus, Saviour of Mankind), and it is possible that this religious symbol was intended as a protective charm. Glass vessels of this age survive in relatively small numbers compared with the amount produced, and almost none have acquired the same kind of legendary status. The name, 'Luck of Edenhall', reflects the vessel's later history. Arriving in Cumberland at some unknown date, the beaker came into the possession of the Musgrave family, who lived at Eden Hall, a house a few miles from Penrith. Although it may have acquired its nickname at an earlier date, we know for certain that the glass was called the 'Luck of Edenhall' by the 17th century, as the name was recorded in the will of Sir Philip Musgrave, the owner of Eden Hall, in 1677. In northern England, the term 'luck' was sometimes given to fine vessels or other objects with an unusual or exotic pedigree, which were thought to possess talismanic power. There are a number of pieces akin to the Luck of Edenhall in Cumberland. These include the Luck of Workington, thought to have been the travelling communion cup of Mary, Queen of Scots, and the Luck of Muncaster, a glass drinking bowl kept at Muncaster Castle near Ravenglass that, according to legend, was given to the castle's owner by Henry VI in 1461. The common superstition about all these special objects was that if they were broken, lost or sold, the 'luck' of their rich and fortunate owners would suddenly run out. The superstition surrounding the Luck of Edenhall was clearly known by many more people than just the family circle by the first quarter of the 18th century. In James Ralph's 1729 collection of poetry called Miscellaneous Poems by Several Hands, the Luck is described as a protective object in a poem that details a drinking match organised by the Duke of Wharton at Eden Hall. The beaker went on to gain a reputation as a fairy cup, abandoned by its supernatural owners when a member of the household interrupted them while drinking at a well in the Hall's garden. Local historians recorded (or invented) this legend in the 18th century – a piece in The Gentlemen's Magazine of August 1791 tells that, as they fled, the fairies screamed out, "If this cup should break or fall, Farewell the luck of Edenhall". With the breaking Luck of Edenhall! The shattered Luck of Edenhall. At our dinner Sir George brought the enchanted Cup, he told us that Duke Wharton used to throw it up in the air, and have a manservant to catch it again. We all drank out of it, the little Musgraves were not allowed to come into the room for fear of breaking it. Sir George showed us where the cup was kept, there was an Iron door and stone wall, in case of fire, the Cup was then put into a tin box. A couple of decades later, the legend of the Eden Hall cup was also mentioned in the first chapter of Anthony Trollope's The Small House at Allington, a novel from 1864 that includes a scene in which guests had to drink from the Luck regardless of the danger that it might break. In the early 1900s, the Musgrave family sold Eden Hall and moved to London. The Luck of Edenhall was loaned to the V&A in 1926, and Eden Hall itself was demolished eight years later. In 1958 the precious beaker was acquired for the collection. 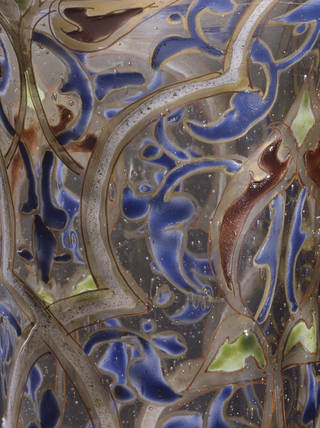 While it is not the grandest example in our collection of glass from the 13th and 14th centuries, it is certainly the piece with the most intriguing story. 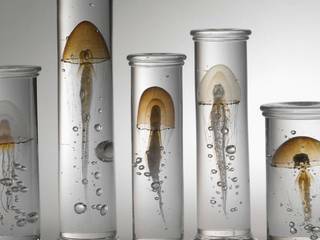 Discover more objects from our Middle East and Glass collections.